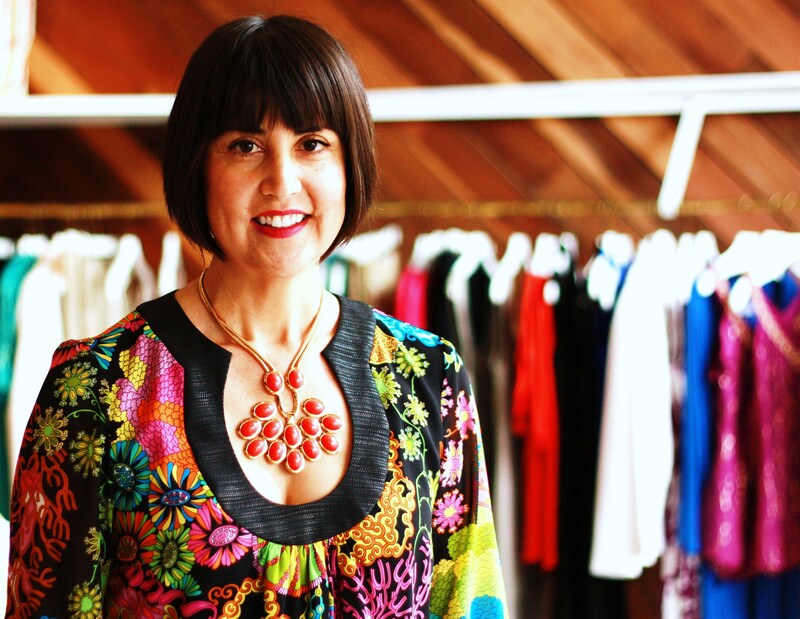 Trina Turk at her Burlingame, California boutique. Photography by Edric Itchon. With influences of classic American sportswear showing up strong among this season’s trends, it seemed only fitting that I catch up with designer Trina Turk, who paid a recent visit to her native Bay Area to work the social circuit and promote her new line of vintage-inspired jewelry. Celebrating the 15-year anniversary this year of her namesake line of sporty women’s wear characterized by its So-Cal vibe of vibrantly colored prints, the prolific Turk—who designs 10 distinct collections annually— took time out at her Burlingame boutique to chat about how she’s fared in the recession, what she still loves about L.A., and why it’s always good times vacationing with BFF’s Jonathan Adler and Simon Doonan. NP: What have you been doing for fun since you arrived in San Francisco? TT: Yesterday after we finished with the afternoon [Junior League of San Francisco] fashion show, we did a little shopping in Union Square with my sister. I love fashion! I can’t get enough of it! But my sister is so the opposite. I dragged her out to get some new shoes. … It’s funny because she has things she’s super into and fashion is just not one of them. I can help her out with the clothing part, but we don’t make shoes—yet. NP: Your brand is very much associated with Southern California. Are there any cues San Franciscans can take from Angelenos and vice versa? TT: I guess the thing I think San Franciscans could take from Angelenos is incorporating a little more color. I think San Franciscans can show Angelenos how to dress when it’s a little colder. San Franciscans are very good at layering. TT: 15 years! This is our 15th anniversary. NP: What have you learned having weathered this recession? TT: What we’ve done over the past 15 years is stuck with who we are as a brand. We haven’t been swayed by trends or wavered much in what we do. We’re always about color and print and great fit, and I think that the whole sportswear influence has always been strong. I think that the collection always incorporates aspects of classic American sportswear, and I do a lot of vintage shopping so that’s always been inspiring to me. We’ve remained true to that idea and that’s what’s helped us through the bad economy. NP: What is the toughest part about being in the fashion business today? TT: There is a lot of amazing product in the market at all price points, so I think that it’s identifying who you are as a brand. You have to define and differentiate yourself from all the competition. 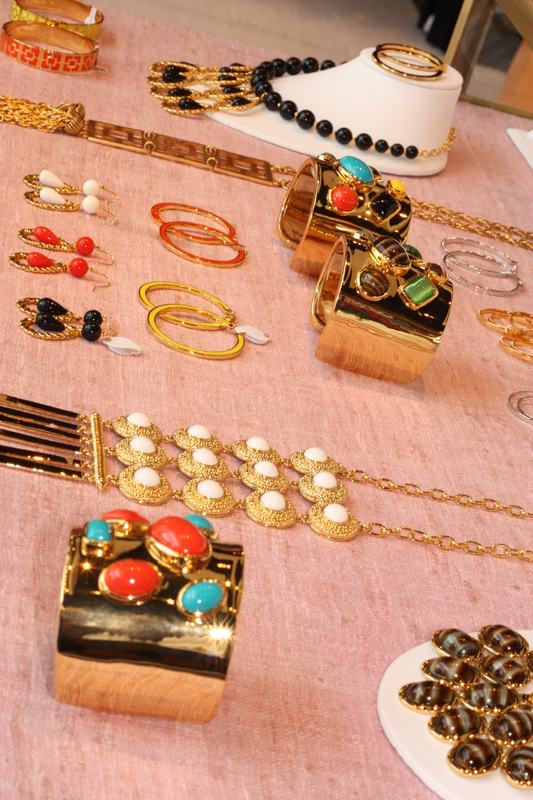 Trina Turk's new line of statement jewelry is priced between $58 to $250. NP: For the new jewelry collection, how were you able to take influence from vintage pieces you’ve been collecting through the years and put your own stamp on it? TT: I think you can never directly knock something off, whether it’s a piece of clothing or a bag, it has to always be updated and reinterpreted to make it modern. In terms of the jewelry line for example, a lot of the vintage pieces I had had hints of color. We definitely incorporated the idea of strong color into the jewelry. We used resin for the colored material. These stones on this are resin. Color was important and the boldness of some of the vintage jewelry was something we incorporated. I don’t wear dainty jewelry. I’m into big and bold. NP: Is the jewelry produced in L.A.? TT: It’s produced in China. Our clothing is 60 to 75% L.A. production and the balance is made in China. There aren’t many people who cut and sew in L.A. We’re one of the last holdouts. But it’s actually I think an advantage. It allows us to be right there, and look at the production if there’s an issue. It allows you to cut to order, instead of blindly ordering minimums on what you may or may not need. It allows us to re-cut hot-selling styles quickly and turn them around quickly, which when you’re importing it adds time to that whole process. Plus it keeps the industry alive in Los Angeles. NP: Speaking of L.A., the city often gets a bad fashion wrap for producing cookie cutter looks—as in Uggs and miniskirts. But there’s actually a lot of diversity there. What keeps you inspired by the city? TT: There’s a ton of diversity in L.A.! There’s a culture clash going on. Obviously, the very strong Latino influence is really important. But the area where our office is very Asian. There’s car culture, there’s surf culture, there’s ‘Cholo’ culture, there’s rockabilly culture. There’s all these things going on, and that’s what makes it so interesting. I guess on some level I think that working in Alhambra [in L.A. county], I’m in this bubble and am removed from the Ugg boots and miniskirts. We do 10 distinct collections per year. So you have to have a lot of ideas and you can’t really obsess over them for very long because you don’t have time. I could get inspired by a museum exhibit, a movie, a piece of fabric, anything. Just living in L.A., you’re exposed to all these different things. People act as if they have to go somewhere, to Bali, whatever. I don’t have to. I love to travel, but it’s not necessary, and in our situation not really possible to go on 10 trips a year to get inspired for 10 different groups. NP: Have you traveled anywhere recently that did happen to make its way into your design? TT: We did a trip to Capri in June with Simon Doonan and Jonathan Adler, and it inspired one of our summer groups. A ton of blue, white and coral. The water is an amazing color. But there’s a stripe of coral color that wraps around the island. It’s amazing! My husband is a photographer and the pictures from the trip will be in Travel and Leisure. We took a lot of pictures and spent a lot of time with them. They are hysterical. It was fun. At some point they got bored taking pictures on all their vacations. But they love to pose and they were the supermodels ready to pose for pictures every day. It was funny and crazy! NP:Where does your love of bold colors and prints come from? It comes from a few things. I grew up in California in the late 1960s and 1970s and that was a very colorful time for clothing. I just remember my mom and other moms in the neighborhood. People were wearing very strong color! Everyone was, especially even in the ’70s men were wearing strong colors. My second job was at OP, the surf wear company. That’s where I learned about the technical aspect of doing printed textiles. It was in the mid ’80s. It was a time when doing multicolored, airbrushed, tropical florals was huge. We did a lot of prints there and I learned a lot about how you put colors together and how you make a print work. That made its way into Trina Turk once we started the company. NP: As far as other designers out there, are there those you’re watching? TT: The most inspirational designers at the moment are Hannah MacGibbon designing Chloe. Phoebe Philo designing Celine. I think it’s interesting that they’re both women. The thing that they’ve done in both of their collections that’s inspiring is sportswear. It’s minimal sportswear, and that’s refreshing. … I also love classic American sportswear designers and look for vintage Rudi Gernreich, Pauline Trugere, and Bonnie Cachin. They did very clean, simple stuff. NP: What’s your must-have for spring? TT: The thing that looks really fresh right now is shorts. Short shorts! You can wear them in the form of a romper or it could be kind of a slouchy short worn with a tank top and unconstructed blazer, which is a look that you could dress up with accessories and heels for a party look. Or you could dress it down with flat sandals for a chic daytime look. I find myself gravitating toward shorter shorts a lot. In New York, even though it’s really cold, the girls in our showroom are wearing shorts with tights and I think that’s going to continue to evolve for fall. With classic American sportswear showing up strong among one of this season’s key trends, it seemed only fitting that I catch up with designer Trina Turk, who paid a recent visit to her native Bay Area to work the social circuit and promote her new line of vintage-inspired jewelry. Celebrating the 15-year anniversary this year of her namesake line of sporty women’s wear characterized by its So-Cal vibe of vibrantly colored prints, the prolific Turk—who puts out 10 distinct collections annually— took time out at her Burlingame boutique to chat about how she’s fared in the recession, what she still loves about L.A., and why it’s good times vacationing in Capri with BFF’s Jonathan Adler and Simon Doonan. TT: Yesterday after we finished with the afternoon [Junior League of San Francisco] fashion show, we did a little shopping in Union Square because my sister. I love fashion! I can’t get enough of it! But my sister is so the opposite. I dragged her out to get some new shoes. … It’s funny because she has things she’s super into and fashion is just not one of them. I can help her out with the clothing part, but we don’t make shoes—yet. TT: I guess the thing I think San Franciscans could take from Angelinos is incorporating a little more color. I think San Franciscans can show Angelinos how to dress when it’s a little colder. San Franciscans are very good at layering. TT: I think you can never directly knock something off, whether it’s a piece of clothing or a bag, it has to always be updated and reinterpreted to make it modern. In terms of the jewelry line for example, a lot of the vintage pieces I had had hints of color. 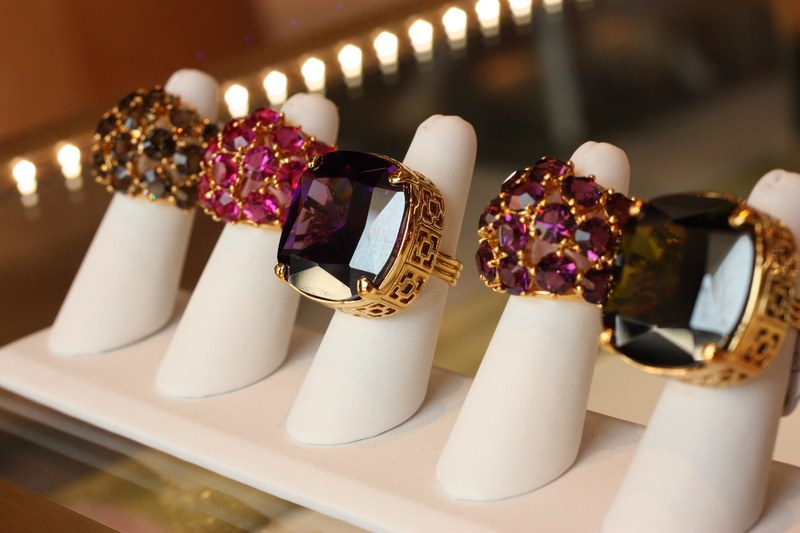 We definitely incorporated the idea of strong color into the jewelry. We used resin for the colored material. These stones on this are resin. Color was important and the boldness of some of the vintage jewelry was something we incorporated. I don’t wear dainty jewelry. I’m into big and bold. Not all, but most of the pieces we did have that graphic quality. Q: Is the jewelry produced in L.A.? A: It’s produced in China. Our clothing is 60 to 75% L.A. production and the balance is made in China. There aren’t many people who cut and sew in L.A. We’re one of the last holdouts. But it’s actually I think an advantage. It allows us to be right there, and look at the production if there’s an issue. It allows you to cut to order, instead of blindly ordering minimums on what you may or may not need. It allows us to re-cut hot-selling styles quickly and turn them around quickly, which when you’re importing it adds time to that whole process. Plus it keeps the industry alive, the actual manufacturing industry, in Los Angeles. Q: Speaking of L.A., the city often gets a bad fashion wrap for producing cookie cutter looks—as in Uggs and miniskirts. But some people don’t realize there’s actually a lot of diversity there. What keeps you inspired by the city? A: There’s a ton of diversity in L.A.! There’s a culture clash going on. Obviously, the very strong Latino influence is really important. But the area where our office is very Asian. There’s car culture, there’s surf culture, there’s ‘Cholo’ culture, there’s rockabilly culture. There’s all these things going on, and that’s what makes it so interesting. Q: Have you traveled anywhere recently that did happen to make its way into your design? A: We did a trip to Capri in June with Simon Doonan and Jonathan Adler, and it inspired one of our summer groups. A ton of blue, white and coral. The water is an amazing color. But there’s a stripe of coral color that wraps around the island. It’s amazing! My husband is a photographer and the pictures from the trip will be in Travel and Leisure. We took a lot of pictures and spent a lot of time with them. They are hysterical. It was fun. At some point they got bored taking pictures on all their vacations. But they love to pose and they were the supermodels ready to pose for pictures every day. It was funny and crazy! Q:Where does your love of bold colors and prints come from? My second job was at OP, the surf wear company. That’s where I learned about the technical aspect of doing printed textiles. It was in the mid ’80s. It was a time when doing multi-colored, airbrushed, tropical florals was huge. We did a lot of prints there and I learned a lot about how you put colors together and how you make a print work. That made its way into Trina Turk once we started the company. Q: As far as other designers out there, are there those you’re watching? A: The most inspirational designers at the moment are Hannah MacGibbon designing Chloe. Phoebe Philo designing Celine. I think it’s interesting that they’re both women. The thing that they’ve done in both of their collections that’s inspiring is sportswear. It’s minimal sportswear, and that’s refreshing. … I also love classic American sportswear designers and look for vintage Rudi Gernreich, Pauline Trugere, and Bonnie Cachin. They did very clean, simple stuff. Q: What’s your must-have for spring? The thing that looks really fresh right now is shorts. Short shorts! You can wear them in the form of a romper or it could be kind of a slouchy short worn with a tank top and unconstructed blazer, which is a look that you could dress up with accessories and heels for a party look. Or you could dress it down with flat sandals for a chic daytime look. I find myself gravitating toward shorter shorts a lot. In New York, even though it’s really cold, the girls in our showroom are wearing shorts with tights and I think that’s going to continue to evolve for fall. Love Trina Turk’s stuff. I go to her outlet store every time I’m in S. California. Yay for L.A.! And for making clothes there (and paying better wages than in China, I’m assuming?). I love those big bright rings.